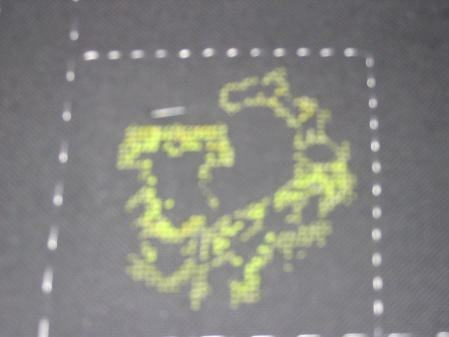 So, I thought I would share a pic of my progress on the summer dragon I am stitching on Jenna‘s RR. For some reason, I cannot get good pictures of these dragons until they are finished. Oh well, at least you can see I really am stitching:). The colors are so pretty in this one, but until I add some more of the lighter greens it is hard to tell from a distance I have done anything. Unfortunatly I won’t have any time tomorrow to work on this. The morning will be set aside for grocery shopping and chores. Then in the afternoon, I have a shopping date with my mom (it is finally time to start looking for some maternity pants) and afterwards we are going to see Celtic Woman at Wolf Trap. Should be a fun afternoon. And here are a few other pictures for your viewing pleasure. 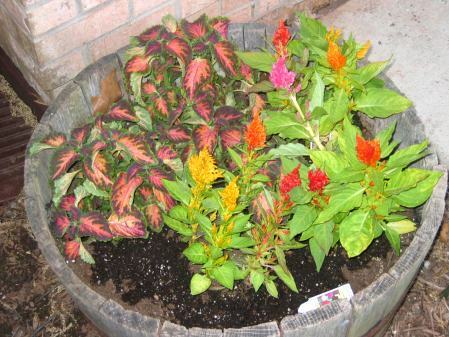 A few weeks ago Allen and I bought some really pretty plants for the planter at the base of our front steps. Here they are…I really love the colors. And last but not least…a very unhappy Cooper. Allen has Cooper “trained” very well and Allen can do a whole heck of a lot to him before he gets upset. 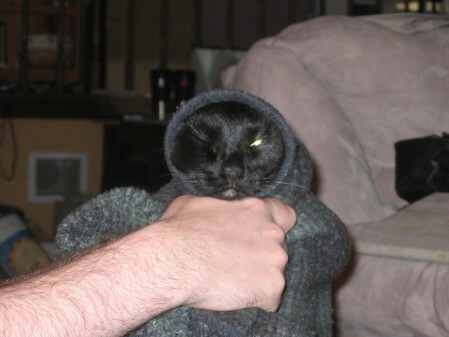 The other day, Allen learned that bundling Cooper in a blanket was not one of these things. It started off well, but then Cooper wriggled and his head popped out of the covers. It was quite an amusing sight. He looks very confused! PS-No kitties were hurt in the making of this photo:) Cooper immediatly curled back up next to Allen purring. He is a strange breed of kitty. Nice to know that Cooper doesn’t hold grudges! It’s funny how we’ve all chosen to start at different points, with different colors. He’s coming along nicely, though. 🙂 I have to say, that picture of Cooper is most disturbing! What a forgiving boy he is! Great progress on the dragon – the colors look beautiful. The start of your dragon almost looks like a map – maybe Dragonland? (lol) The colors are so pretty. Cooper does look a bit confused but since he knows neither of you would ever hurt him I’m sure he didn’t care. Hope you had a fun time shopping with your mom.